One of the first engineering thermoplastics, PA, Polyamide also known as Nylon, has been available for more than 50 years. A polyamide is a macromolecule with repeating units linked by amide bonds. Polyamides occur both naturally and artificially. Examples of naturally occurring polyamides are proteins, such as wool and silk. Artificially made polyamides can be made through step-growth polymerization or solid-phase synthesis yielding materials such as nylons, aramids, and sodium poly(aspartate). Synthetic polyamides are commonly used in textiles, automotive applications, carpets and sportswear due to their high durability and strength. Generally speaking, PA Nylon is a semi crystalline thermoplastic with low density and high thermal stability. There are often numbers associated with nylon plastics types such as 6, 66, 12 and 46. These numbers relate to the molecular structure of the nylon polymer and each structure type will have different properties. The most common polyamide plastics are Nylon 6 extruded, cast PA 6 and PA6,6. Polyamides are among the most important and useful technical thermoplastics due to their outstanding wear resistance, good coefficient of friction, and very good temperature and impact properties. In addition, nylon polyamide exhibits very good chemical resistance and is an especially oil resistant plastic. This excellent balance of properties makes the PA polymer an ideal material for metal replacement in applications, such as automotive parts, industrial valves, railway tie insulators and other industry uses, whose design requirements include high strength, toughness and weight reduction. Polyamides come in a variety of types, each having its own unique combination of properties. These properties can be enhanced by the use of additives such as glass fiber, mineral fillers, flame retardants, toughening agents, and other chemicals. 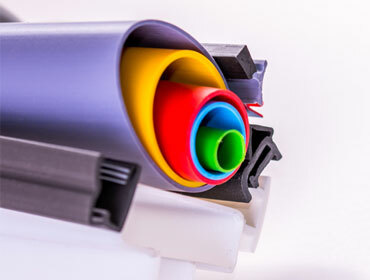 KASTRADE offers Polyamide 6 and Polyamide 6,6 for Extrusion Profiles in a wide variety of Grades. These Polyamide Profiles retain their properties, characteristics and dimensions in operating temperatures upto 2300 C (1 hr.). During Aluminium coloring process, undertaking that conditions are correct, Polyamide Profile's dimensions and the mechanical properties remain stable. Additionally, the presence of Carbon Black in raw material Polyamide, Profiles are UV resistant. PA-6,6 25% glass reinforced and Aluminium have approximately the same coefficient of linear thermal expansion, their dimensions change the same way with the temperature changes. 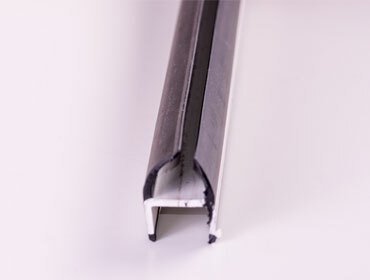 Polyamide Profiles retain their properties, characteristics and dimensions in operating temperatures upto 2300 C (1 hr.). During Aluminium coloring process, undertaking that conditions are correct, Polyamide Profile's dimensions and the mechanical properties remain stable. 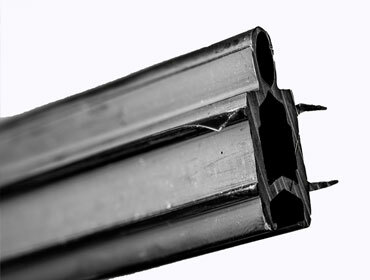 The presence of Carbon Black in raw material Polyamide, Profiles are UV resistant. * - This value is suitable for “I”shaped Polyamide Strips. Actual values could differ based upon the Profile shape & has to be discussed. Unless otherwise specified, all data listed is for natural or black colored materials. Pigments can affect properties.